Betta Fish and Betta Fish Care > Betta Care > Planted Betta Tanks > Will I need artificial light? Will I need artificial light? I'm getting ready to start my first 20 gallon long planted tank. I wasn't planning on getting overhead light since my only space is within my window (never gets direct light). I've attached a photo believe and was wondering if you think the plants will get enough light or if I'll need to get an artificial hood? Wow, what I could do with a 20 gallon tank. ( what am I saying, I just got a 55 gallon two weeks ago.) Anyway you have a really great space to work with in a planted tank. To answer your question on lighting. My answer would be this. first if the tank came with a hood and light, use it. It would be good for low light plants. Just having the tank in a window will not give enough light for plants to survive. (unless it is direct sunlight for more than 8 hours a day. 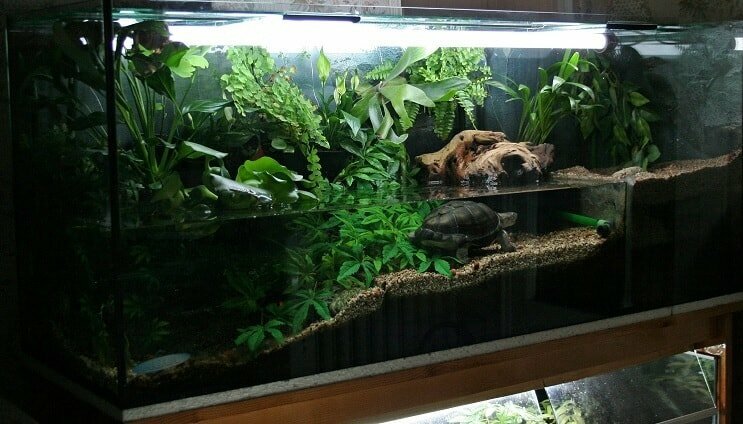 Depending on what plants you will be putting in lighting is one very key factor in their health and growth, I see by the picture you posted this tank does not have a hood but a glass canopy. This is a great way to start. No really. Every tank I have has a glass canopy. from my 3 5.5 gal. on up to my 75 gal. All of my tanks also have Finnex Planted Plus lighting which gives me medium to high lighting in the tank, and allows a very wide range of plants. And really depending again on the plants you are going to have I would recommend at the very least a Finnex stingray. Both are LED lighting. The Stingray is a medium light source for low to medium light needing plants. The planted plus is a medium to high lighting source. The cost of these lights for a 20 gal would be for the Stingray $49.99 + shipping cost and for the planted plus it would be $94.99 + shipping. They are 30 inches long ad about 3 inches wide and would sit right on top of the canopy. The legs are adjustable to your tank size of 30 inches long, I have used these Finnex products for about 15 years now and have never had one fail. You would order from another of their company's called AquaVibrant. at Welcome to AquaVibrant -. I know from personal experience that a planted tank Takes two very major things to be a success. One water parameters and purity, and the right amount of lighting. Like I said above I could have a lot of fun with a 20 gal. Ido think it would be a great home for a beautiful betta boy. He would be in HOG HEAVEN in a 20 gallon heavily planted tank. So much room to explore and than patrol. Oh I'm very excited! Petco had the 1$ per gallon sale and sadly the only thing I can fit in my tiny little space is this 20 long (plus I don't need to be going overboard lol). So I got myself a glass top as I didn't feel that I needed the very expensive overhead light from petco (figured I could go back/find a better price some place else). Does the stingray hand over the tank or sit on top of? I'll do my research on it soon so I may answer my own question. On a side note my boyfriend would love to try some Aquaponics on this tank so I'm also trying to consider the light source for that. As of now I think I wanna do low tech set up and aquarium soil so I can have a lush planted tank for one handsome betta boy :) maybe shrimp as well but I really just want to give the best home to a little guy in need. I really appreciate your reply and I will start my research on stingray's and then on related plants for this beauty! I cannot wait to share what the set up will end up like! EDIT: Well I did a quick search and got my answer for how the stingray sets up lol so my next question is is the stingray safe to just sit right over the glass canopy or do I need to have nothing between the light and the plants? I'm going to assume it's fine and won't damage or harm anyone but figured I'd cover all my bases. 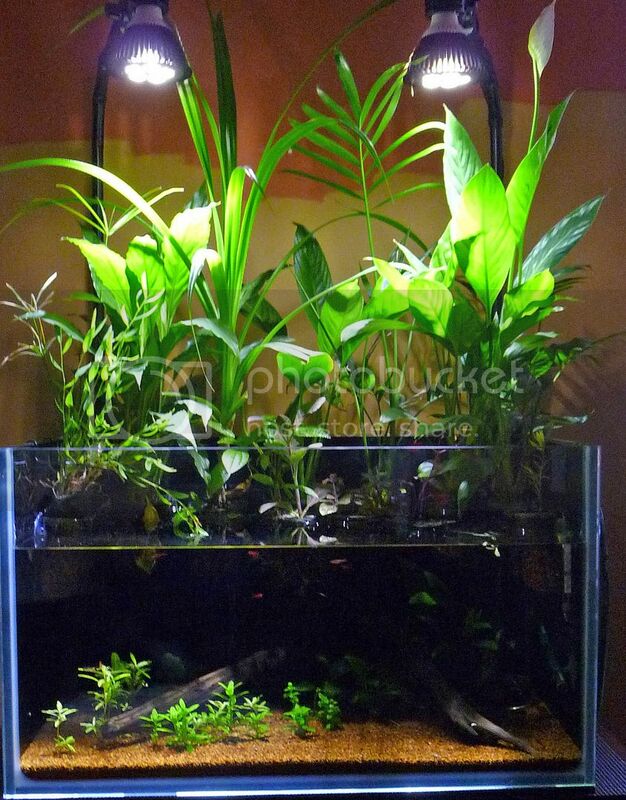 In that set-up, without a tank light, you can grow low light plants like anacharis, anubia, and java fern. If you want to get into plants that have higher light needs you are going to have to get a light. I've successfully grown all the plants that I mentioned in my 3 gallon and 1 gallon tanks that I had by windows and never had a light on the tank, for most of the year the tank did not receive direct sunlight and the rest of the time they only got direct sunlight for maybe an hour or two. To answer your question in the second post yes, you can set the stingray directly on a glass canopy, it's what I do on my 5 gallon tank. That shape and that position would be perfect for a paludarium. That is a tank where plants grow up out of the water. If you chose plants like pothos or peace lily that have low light requirements, then a north facing window wouldn’t be a problem. It would look stunning growing up in that position. Absolutely stunning.